How about another thriller? I’ve been doing a lot of those lately, haven’t I. All for good reasons, as I’ve shared before. This one, however, isn’t quite a thriller. It’s more a suspense. There’s also a romantic element to it, which sweetens it up a bit. Would you like to know more about this book? Let me share! Steven Ashton, a billionaire from New York, and Emily Grant, on the run from the law…and when they meet he can’t help falling for her. What he doesn’t know is that interfering in her life will put his own life in danger. 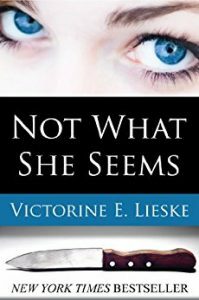 I have read other books by Victorine E. Lieske before. I figured this one would be a good one to try. After all, she’s great with her romance novels! So how does she do with suspense? Let’s find out. I’ll first share what I liked. Not What She Seems is very well-written. I thought the storyline was enjoyable and easy to follow. I love that it’s a clean novel. Many books in this genre tend to be even just a slightly bit dirty. This one wasn’t whatsoever. So that’s a huge plus. Especially for those younger people who like to read suspense. Another huge plus was that you never find out the culprit until the very end. I have to admit that it wasn’t someone I had suspected so kudos to Victorine for keeping it a mystery! Was there anything I didn’t like? There were a couple of things. The first was that toward the end, I had to reread some parts just to make sure I was following right. Overall, the book is very easy to follow and makes tons of sense. There was just a few parts at the end where I had to recheck. Another downfall is that much of the story was predictable. Not so much the biggest part of the book, but much of the rest was. Lastly, I wasn’t feeling the romance aspect of the story at all. It was cute, but didn’t do anything for me. All in all, I rated this four stars! If you go to the Amazon page for this novel, which I have the link just below, you’ll see that it has tons of reviews all in favor of this story. It’s also a New York Times Bestseller so that says something, right? Okay. Now that I said my piece, go check it out!